Protect your glass at your home or office. For organizations and homes alike, the threat of burglary, graffiti and damaging storms are all too serious. Regardless if you need to protect your business or children, Solar Art offers Security & Safety film to make sure everyone is safe. Every customer has different needs, so we offer Safety & Security film in different thicknesses from 4 to 14 mils. A few of our select thicknesses are available with solar control to keep your home or business energy efficient and free of dangerous ultraviolet rays. There are many reasons to love Solar Art Safety & Security film. It strengthens your glass and also is applied quickly and doesn't obscure your view of San Diego, California. From 4 to 14 mils, every one of our thicknesses strengthens your windows against damage. 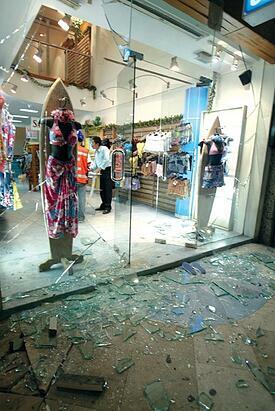 Though unlikely, if your window does sustain damage, any small glass shards will be contained by the film. From severe storms to intruders, Safety & Security film is a smart way to add strength to the glass in your house or commercial property. When it comes to burglary, a majority of burglars come in through glass doors or sidelights. Untreated glass doesn't stand a chance against these invaders. However, even the lowest thickness of Solar Art film can increase power by 2 to 3 times its original ability.